A great starter reference book! We're so happy to carry this wonderful book by Certified Aromatherapist and author, Kymberly Keniston-Pond. 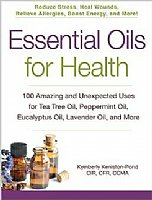 She covers twelve of the most affordable and versatile essential oils, and teaches how to use them in 100 recipes. Learn how to use essential oils for your daily health and beauty routines. Included are recipes for emotional stress, skincare, common health issues and more. Step by step directions with helpful tips and safety information. We love this book because it's so accessible and easy to follow, making it a fantastic choice for someone new to aromatherapy as well as someone who wants safe and effective recipes at their fingertips.